Stick to the plan. Whatever it is. As Josh Allen began his career as the Buffalo Bills quarterback this past weekend, it was the first chance for the Bills coaches and decision makers to observe and work with their first round draft pick. That will continue through the offseason workouts and into the preseason. But what about when the regular season begins? What is the plan for Allen? Sit this year? Play right away? Sit half the season and then play? Let him compete for the starting spot? No one knows. Maybe the Bills don’t even know. Quotes from GM Brandon Beane were expectedly vague, although they left the door open to Allen starting the season opener. Sean McDermott wouldn’t go into specifics about his plan for Allen. But there must be some kind of plan in place, or at least ideas from the coaching staff about the best ways to let Allen mature as a quarterback. That’s where they must be resolute in sticking to that plan, whatever it is. Most draft experts and educated observers believe that Allen needs time to mature and get used to a much higher level of football in the NFL. Remember, he played at Wyoming. His few games against Power 5 schools like Oregon, Iowa State and Nebraska did not go well. So is that the main reason the Bills may say that he sits for a while? What is a while? A few games, half a season, his whole rookie year? Maybe Allen doesn’t need to sit. Maybe he has adjusted and learned from a winter of high-level workouts and NFL prep from his QB guru, Jordan Palmer. Maybe that learning has already happened. Would the Bills be able to say right now that Allen needs “x” amount of time before he starts a game? Beane’s quote indicates no. Or maybe his quote says they know he needs some time, unless he blows everyone away (including his teammates) in the preseason and is clearly the best QB on the team. Then that wait time disappears. I know a lot of fans point to the Chiefs handling of Pat Mahomes. He didn’t start until the last game of the season. But remember, Alex Smith was playing well ahead of him and the team was winning. It was easy for KC to stick to their plan. So the Bills decide that Allen needs to sit, and A.J. McCarron (or Nathan Peterman) wins the starting job. How long do they keep that job? If the plan was for Allen to sit and watch and learn, how does ineffective play or injury effect that? If McCarron gets hurt in the opener, does Peterman go in to keep the Allen plan in effect? Or does Allen win the backup job and then take over? That has to be part of The Plan. If McCarron and Peterman both fail to move the team, does Allen get that chance? What if that happens before the coaches believe he’s ready? Speaking of #2 or #3 QB, what will Allen be designated? Remember, no one other than the starter gets a lot of practice reps during the season. Allen would probably see more reps as #3 running the scout team. Reps, yes. But not reps running Buffalo’s offense. How much does that help? Would he become the backup just to get more experience with Buffalo’s offense? If so, then he needs to be ready if the starter gets dinged, hurt or out for the season. You can look around at the league and see a lot of different young QB plans. Some have worked, some have failed. Marcus Mariota, Jameis Winston and Carson Wentz started from their first game. Jared Goff, Mahomes and famously, Aaron Rodgers, waited at least part of a season to start. Rodgers doesn’t really count as an example because that was too long ago and he had a Hall of Famer in front of him. But there’s no doubt that waiting helped Rodgers become the star he is now. There is no definitive plan for how to do this. Do the Bills take some lumps as a team and play Allen now, knowing that could prepare him for a 2019 playoff run? Or do they sit him and let him watch for the same reason? There is no right or wrong way to do this. I think that’s what Beane was referring to in his quote. If the Bills decide that Allen needs to sit, then they need to hold to that. At some point, fans & media & maybe ownership will demand that Allen play this season. That will probably be triggered by the team’s lack of success or ineffective play from McCarron or Peterman. But if the plan was to sit Allen, then they need to ignore all of that. There can’t be a rash decision or a dramatic change in The Plan. Not so easy to do if the Pegula’s demand it. But that’s what Beane & McDermott were hired to do. Make the Pegulas aware of the plan, and why it was developed. Then they won’t come in on a Monday and ask why Allen isn’t playing. Ignore the fans and media. Beane was hired to draft the best QB for the franchise, You can’t take out his legs part of the way if he believes that only happens to Allen if he sits. Thanks to training, coaching, passing camps & spread offenses, young QB’s are more ready to play quicker than ever before. Does that appy to Allen? Maybe. So I would not be shocked or angered if he does in fact play this season. That will be good sign. That would mean that Allen is a quick learner and developed faster than anyone thought. But I’m not an NFL coach. I want those guys to have a plan in place and stick to it. 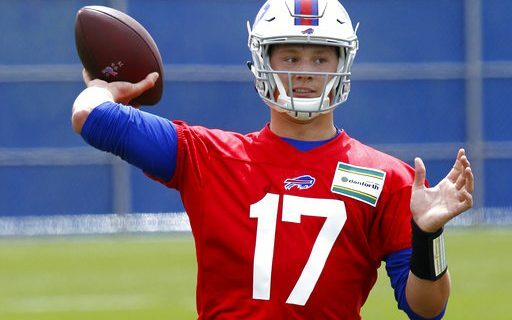 QB guru Jim Kubiak has his own ideas about how to develop Josh Allen.